Carline Sitterud, the CEO of Curvaceous Closet, was born in Massachusetts but grew up in Arizona, where she lived for 30 years. Four years ago, she moved to Charlotte with her husband, David, and their four children, Brooke, 22, David, 14, Devyn, 11, and Dylan, 11. She loves traveling and visits Massachusets at least twice a year to visit all of her friends and family. She’s been an entrepreneur for years but recently started a local mobile clothing store, Curvaceous Closet, and we had the opportunity to speak to her about it! Enjoy the article, and be sure to tweet your thoughts and questions to @CBRBiz! 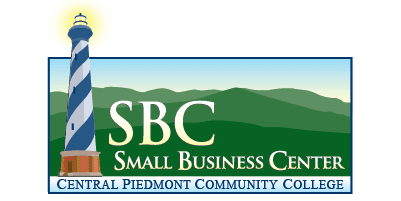 Charlotte Business Resources (CBR): When did you first become interested in being an entrepreneur? Did you always envision a store like Curvaceous Closet (CC)? Carline Sitterud (CS): I had a business prior to starting Curvaceous Closet. I was a Wedding Photographer for the past 13 years, which I started in 2001. So I had a foundation when it came to business and growing it. I also worked in Corporate America and processed loans/gave financial advice to consumers for 10 years. 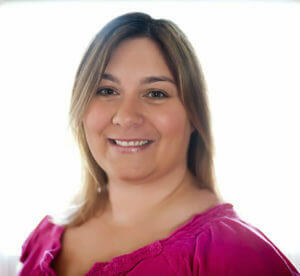 When I started Curvaceous Closet, there was still a lot to learn, but I had the fundamentals of business down. Also, I’ve always liked working for myself and being my own boss. CBR: Was there an “Aha!” moment (or several “Aha!” moments) that led to the conception of CC? How and when did you realize that you wanted to open a store like CC? CS: I actually love telling this story! I wanted to go somewhere for Spring Break in 2014, and a new friend of mine (Pamela) said she wanted to go, so we packed our kids and took off for the weekend. One day at breakfast, we were talking about life goals, and she asked if I still wanted to go to Nursing School. I said no. I was 40 at the time, and I didn’t want to start all over with school. I told her I always wanted to start a clothing line, especially for plus sized women, because the clothes that are currently made are hideous, but it’s so hard to get a clothing line off the ground. I was all WHAT? That is a FANTASTIC idea! That weekend, I couldn’t get her idea out of my head. I did a ton of research when I got home. I wanted to make sure it was a viable business. I conducted a focus panel with people I knew; I sent out an anonymous survey to see what the feedback was. It was all positive. I then talked to my husband, and he thought it was a fantastic business as well. 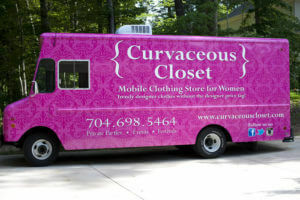 A month later, I bought a truck, gutted the inside of it, and made it into Curvaceous Closet a.k.a. The Pink Beast! I always think back to that moment at Myrtle Beach–“Everything happens for a reason”. CBR: What were the early days of entrepreneurship like for you? Based on your experiences, what advice would you offer fellow entrepreneurs starting a business for the first time? CS: Do your homework. Make sure there is a need. You have to have drive and determination in this business. People won’t just come to you. You need to market yourself appropriately. And save money before jumping in. I’ve had several women come inside my truck and say, Ohhhh! I’d like to do this! I say, Go for it! But be prepared to spend a lot of money. Just like any business, you have to spend money, and it all adds up, especially as a mobile boutique! CBR: How do you think Charlotte’s business climate differs from other cities? Which local resources did you find to be the most useful? CS: I’ve found the people of Charlotte to be so welcoming! I’ve had so many positive experiences, from businesses to people just driving by and stopping inside the truck. The Charlotte Center City Partners (CCCP) have been great about getting mobile clothing boutiques into several of their events. They’ve personally invited me to a few. It’s partners like CCCP and businesses that see the potential we possess. I also belong to several networking groups in Charlotte (LeTip, Ewomen and Heartlink), and they have been instrumental in the success of my business! CBR: On your website, you say that you purchase your clothes from “up and coming designers in LA.” Can you tell us more about how you source your items, what you look for in clothing, and what types of fashion trends and styles people can expect to see in your store? CS: Growing up on the West Coast, I went to California a lot! I loved the styles they have there, so I brought the West Coast styles to the South. The fabrics I pick are vibrant in color, so it’s unlikely you will find a lot of black pieces in the truck. I also love peekaboo sleeves, racerback dresses (for the summer) and just unique pieces you wouldn’t find in Charlotte. The designers all come from LA, so you won’t find anything you see in the truck in a traditional brick and mortar store. And what’s also great about that is when you buy something from Curvaceous Closet, more than likely, no one will have what you’re wearing. I typically buy six dresses of the same design, and if I try to order it again, it’s impossible. The designer has moved on to something different. CBR: One of the most fascinating aspects of your store is the fact that it’s a Mobile Clothing Store. What inspired you to go in this direction? CS: I wanted to be different than a traditional store. I want to make shopping convenient for my clients. I make house calls and lunch break stops during the week, which means I drive to my clients and let them shop in the convenience of their home or office. I also attend events and have private home “Sip & Shop” over the weekends. I also to give all clients impeccable, one-on-one customer service. I carry sizes 4-24, so women of all shapes and sizes can shop together! There are very few stores that carry that range of sizing. CBR: What are the unique challenges and benefits of managing a Mobile Clothing Store? What was the process like? CS: Finding areas to park during the week is one of the challenges. I can park on private property and sell (with the owner’s permission), but finding unique locations can sometimes be challenging. But I work through it. The benefits are meeting wonderful people each and every day and working when *I* want to work. I have 3 boys at home now. If one gets sick, I don’t have to call an employer to get that time off to care for them. I get to work very flexible hours. I love the freedom I have with this business. It’s actually very liberating. CBR:How can people find your store or book a private party? CBR: What has been your proudest moment to date? And where do you see your business in the next 5 years? CS: My proudest moment was when Larry Sprinkle did a little segment (Larry’s Look) on my fashion truck with a few other of my fashion truck friends. It was an awesome moment. He was such a great guy. He made me feel very comfortable, and we had a great time. In the next five years, I want to expand Curvaceous Closet to women all over the US in a different capacity. Stay tuned! CBR: What’s the one thing about CC that you’d like for people to know that they don’t know now? 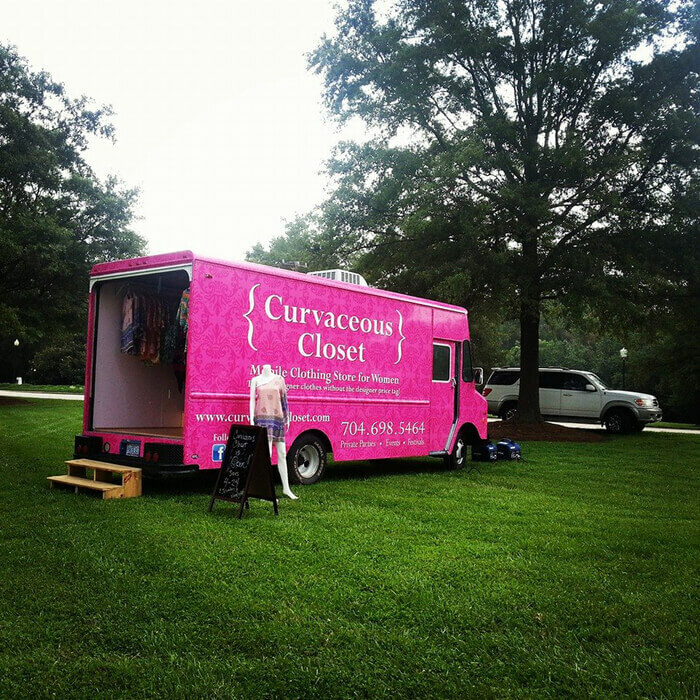 CS: There is never a cost to have Curvaceous Closet at your home party or event (within an hour drive from 28104), as well as the fact that I make house calls to Weddington, Ballantyne, South Charlotte and Pineville areas as well, at no cost to my clients! CBR: What else would you like to add? CS: Shopping can be a daunting task, I’ve made it easy. When you shop with me, it will always be a fun experience. 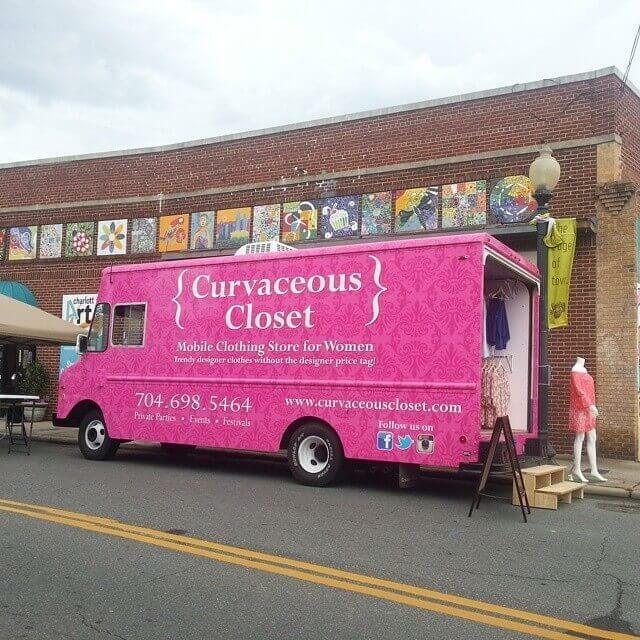 Thank you, Carline, for taking the time to tell us more about Curvaceous Closet. To learn more about Carline and her business, be sure to visit her online. Have a question or thought about this article? Share it with us on Twitter–@CBRBiz!